Both systems incorporate Fuji’s patented noise reduction system, which cuts turbine noise levels by more than 50 percent. From 15 feet the Q4 PRO turbine runs at just 61 dba, as compared to normal conversation, which is usually around 60 dba. 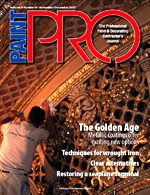 The Q4 PRO was designed for professional fine-finishing applications, including lacquers and enamels, as well as water-based and oil-based coatings. It delivers approximately 7 psi and comes with a 25-foot hose and washable air filter. 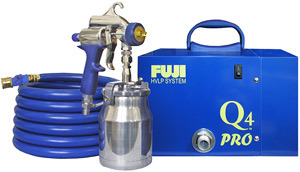 Both Q-series models also come standard with the new Fuji XT-2 Non-Bleed Spraygun, which keeps bursts of air from blowing dust around the spraying environment and ensures less paint buildup on the tip of the fluid nozzle.